Two separate events are monitored in March and July of 2003. 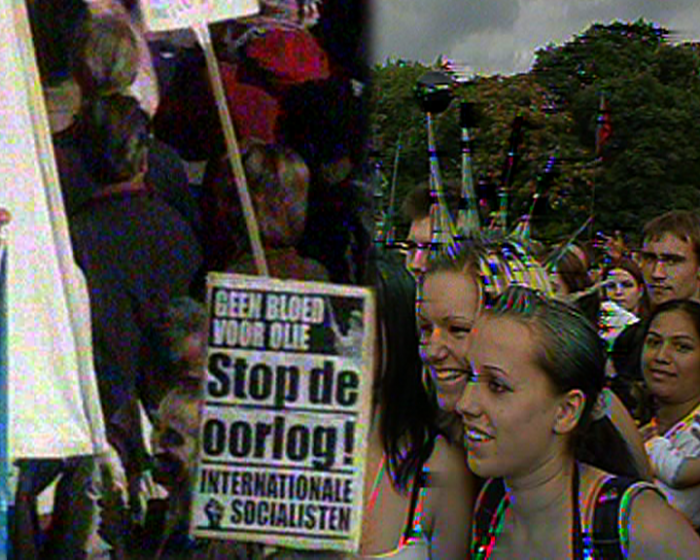 To the left, police surveil the crowd at an anti-Iraq war protest in Amsterdam, and broadcast live video back to central command. To the right, a television crew sends live video from the street at the Love Parade in Berlin. Both live, unencrypted video transmissions are intercepted by the artist who carries a video scanner with her. The video is itinerant and unstable, flickering in and out of readability. The two camera operators, the policeman and the television crew member, move in and out of the crowd, scanning over groups, zooming in towards select people and then zooming out again. In some ways the operators are looking at similar things. People meet together in a form of solidarity and collective action. There is music, dancing and young, pretty girls. However the operators also look for different types of action, different types of titillation. Where is the location of the potential threat? Who is willing to perform the most audaciously for the camera? Comments closed — Trackback URI RSS 2.0 feed for these comments This entry (permalink) was posted on Friday, February 27, 2009, at 2:08 am by admin. Filed in Video.